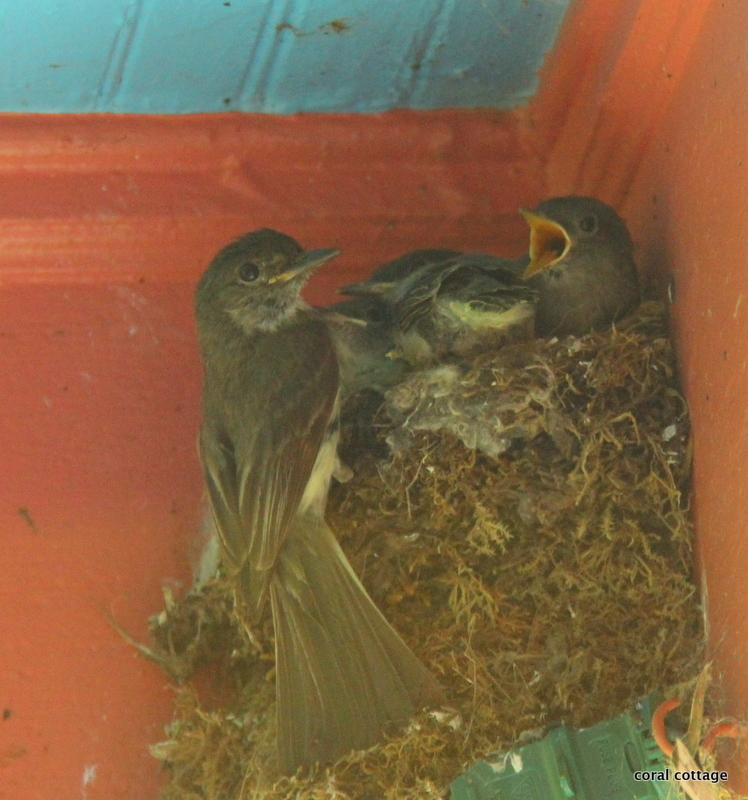 This is the third summer we have hosted the same Phoebe family. 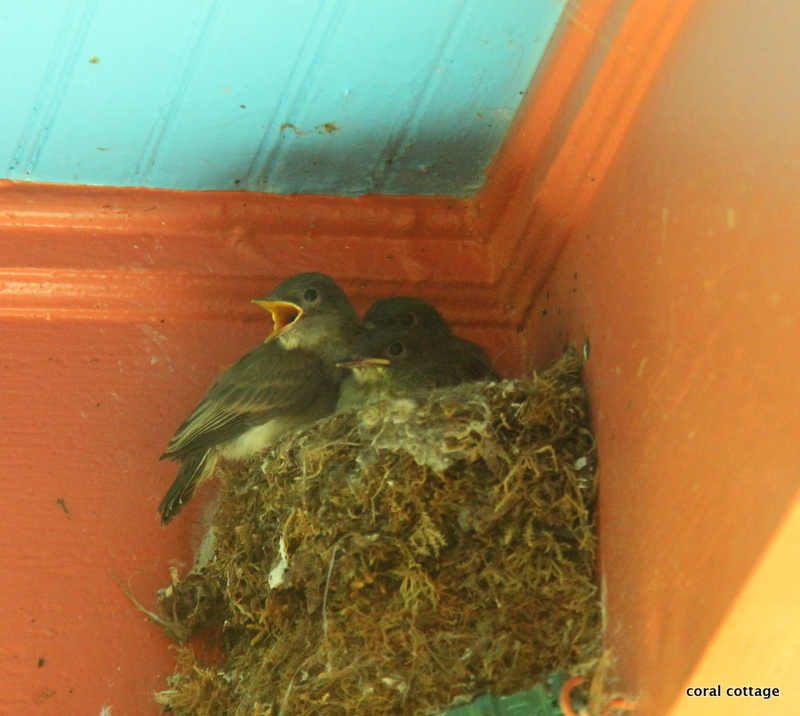 They have built a lovely condo for themselves up in the corner of our front porch roof. 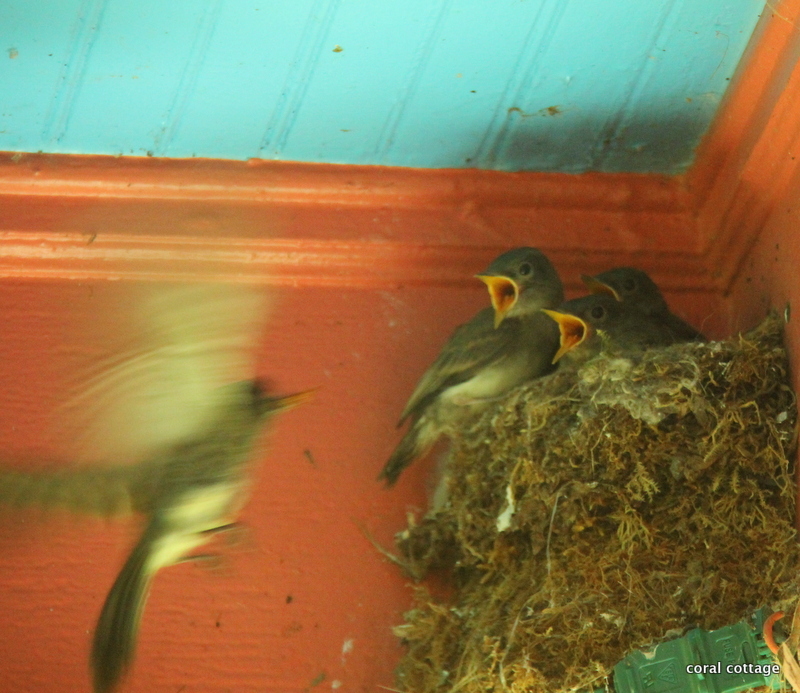 I took these photos through the glass of my front storm door. The smudges on the glass are from me pressing my face against it trying to get a better look at the babies. There are three in this group, the fourth fell to his death during a storm last week. That was horribly sad and broke my heart. 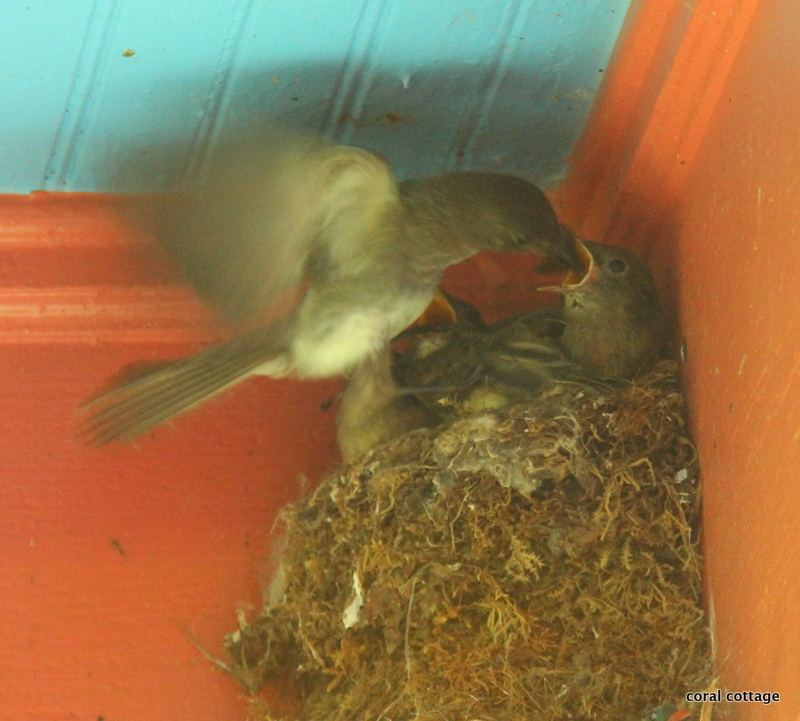 They poop all over the porch and make a mess with their nest droppings and bug guts. Each summer we say perhaps we will pull it down after they fly away, hoping they will re-locate. We don’t though. For a few weeks twice a summer it feels like a great honor to have them. 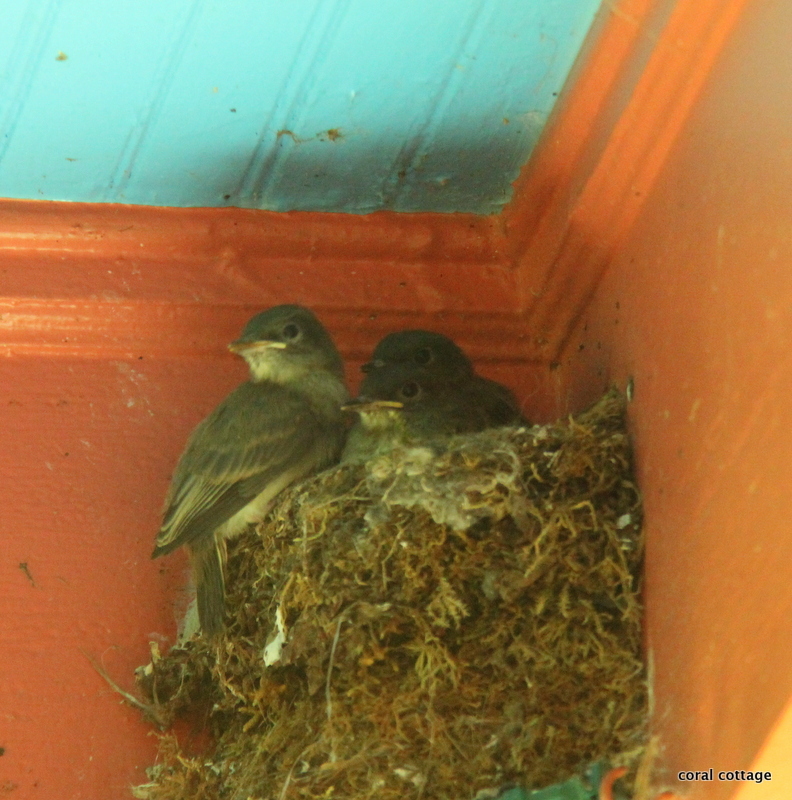 I am always amazed when I come down stairs and open the front door and discover that the parents have moved them out of the nest in the dark of the night. It seems so brilliantly smart, especially when you know that my cats lay on the porch under the nest each day patiently hoping that one will slip out and into their waiting paws. Rest assured it hasn’t happened yet. 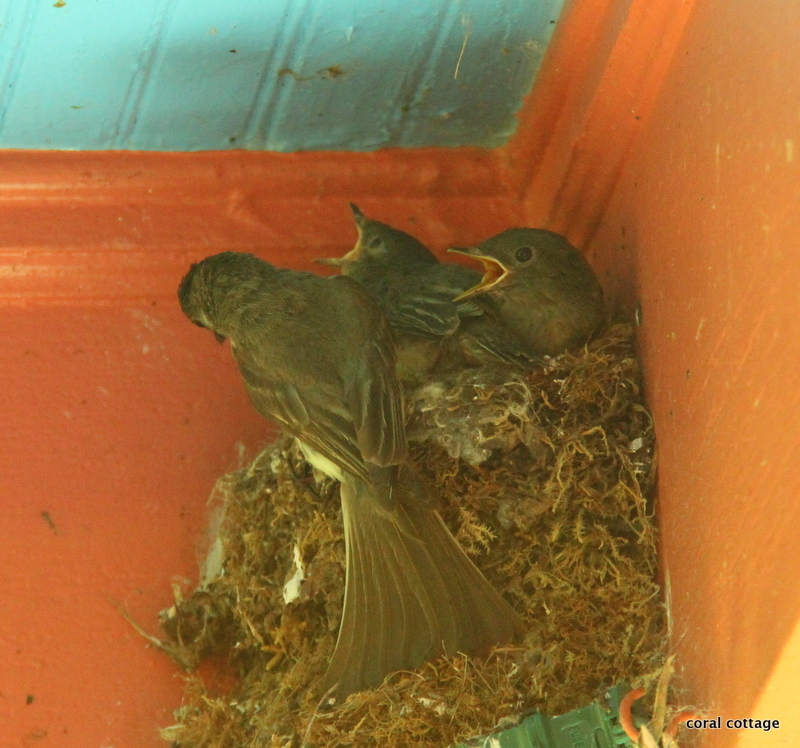 Both parents take turns catching insects and feeding the young. I am not sure which one is placing the moth in the little waiting mouth. Too sweet. Sigh, I am going to miss their sweet peeping. I feel fairly certain they will fly away either tonight or tomorrow – just a gut feeling, and so I’ve named them the freedom flyers in honor of the holiday. For my fellow Americans celebrating Independence Day tomorrow – I hope you have a safe day. 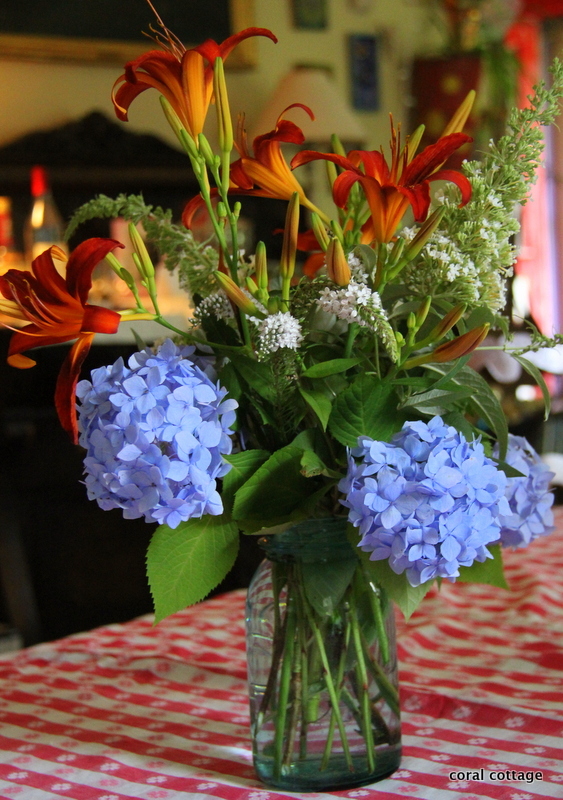 I’ve made an attempt at cutting some red,white and blue flowers from my garden to place on the kitchen table. P.S. 6:15 am July 4th – The Freedom Flyers safely left the nest in the night. My porch seems very quiet and still this morning. If they keep the same traditions as the past few years Mr. and Mrs. Phoebe will return in a few weeks for a second brood. P.S.S. 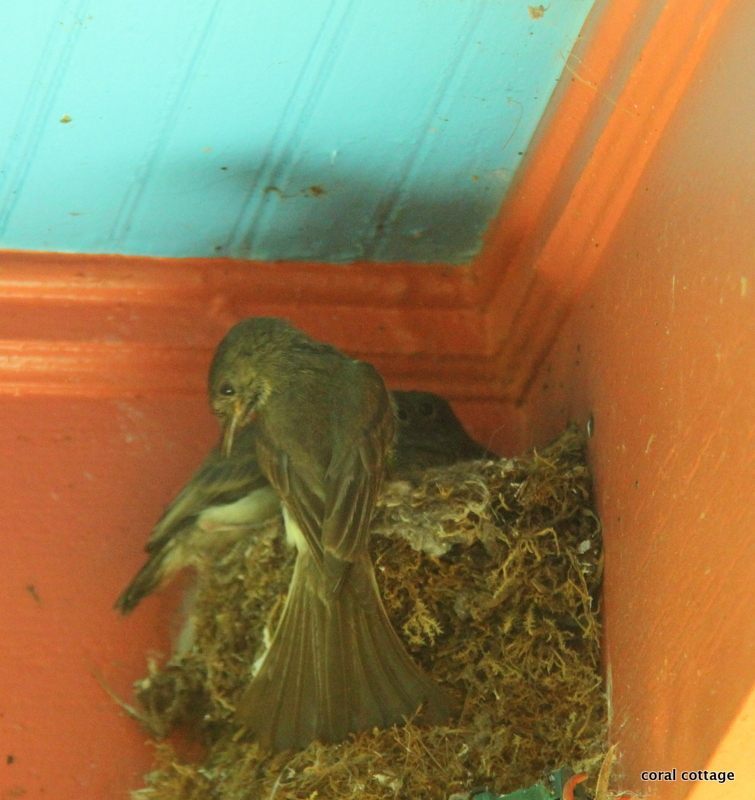 8:00 am – I just discovered one of the babies, has been left behind in the nest. It is crying to be fed. I will keep you posted. Kim of Red Dirt Farm • This entry was posted in Uncategorized and tagged animals, aviation, birds feeding in the nest, blue, canon eos 60d, country living, cut flowers from the garden, flowers, Independence Day, nature, nature photography, Phoebe birds, photography, red, virginia, white. Bookmark the permalink. Kim, I have had a very blessed life, even thought the hard times don’t always feel that way. I loved living on our waterhouse! The backstory: Until I was 13 yrs old we lived in Kansas City…Dad, Mom and four kids. My dad was a very busy oral surgeon and we didn’t see him much during the week, and sometimes on weekends he was on call. So, my parents having a love for boating, we had a lovely old cruiser on the Lake of the Ozarks in central Missouri. Mom would pack us all up…food, clothes, swimming suits, even the dog…almost every weekend from Easter to Thanksgiving and when Dad arrived home Fri evening we would start off in the station wagon and make the 3.5 hr trip to the lake. Unload everything onto the boat and take off in the dark of night to find a cove to drop our anchor in. We spent the whole weekend together on a 38ft boat, with a runabout for skiing, and those were wonderful, sometimes magical times, mostly because we were all together…and that was the ’60s and ’70s as well when life was much different. Those times are really my best memories from my childhood. Well, when I was 13 all my siblings had left home (since I was an “oops!” baby I was quite a bit younger) my parents asked me what I thought about moving to the lake…sounded great to me! The thing was, my parents didn’t want to move to the lake only to get away from it being busy with everyday life…their solution was to literally love “on” the lake. We lived on our boat (a larger version at 45 feet, but still a lovely old wood Chris Craft lady) for a year while the charming floating house my dad designed was built. Is is Cape Cod style, two story with the lower level consisting of a much needed utility room/workshop/laundry room and also a lovely screened in porch with our well loved white wicker furniture. The living quarters were upstairs with one full bedroom with walk in closet, a sleeping loft with two twin beds, a small but full kitchen and a great room with high ceilings and lots of windows. The structure also had a large boat slip for the cruiser and two smaller ones…one for the speed boat and another for guests. We also had a huge upper deck for gathering, eating out, etc. It was really a dream come true…all those weekends at the lake my parents would say on the way home “someday we won’t go home on Sunday night”….they named the waterhouse “Someday Place” with a plaque that graced the little gate at the top of the walkway across the lake. It was amazing to live there…to walk out the door and take seven steps to jump in the lake, to have friends over and jump off the upper deck to swim, to have slight movement in the house though nothing like a boat…it is sturdy! , to be surrounded by nature like the ducks, the great blue herons, an eagle here an there, the deer on the property, etc. The only drawback was being a major attraction for people boating….in the summer a constant line of boats would come to our cove, right up to the house sometimes. But, you learn to live with it…we were interesting! I grew up my remaining teenage years in that home and came back ‘home’ many times to visit until my parents age and health forced them to sell the waterhouse in 1998, I believe. It required a great deal of upkeep, and winters were especially hard with keeping circulators going to keep the water from freezing, dealing with slippery docks and walkway…my dad fell once. The man we sold it to did not take proper care of it, but fortunately now a couple owns it that loves it almost as much as we did, and they have fixed everything that was broken and have made improvements and are caring for it properly. That feels good. I wish I had photos on my computer to share with you…if I ever get some I will do so. Thank you for your friendship, Kim! Sara – what an amazing story. Your parents must have been free spirit, bohemian hippies. Your dad must have had a conservative dr. side that longed to be in touch with the water and nature. I close my eyes and walk through the rooms with you and I imagine the details, the love that your parents put into their dream and the adventures that you all must have had. I’m sure it must have been heart breaking to have the new owners not give the same care. My mom was a bit older than all of my friends mothers growing up and she was prematurely grey ( guess I would be too if I didn’t have the best hair stylist in the world) anyway when I would go out with my mom my friends would say “oh your grandmom is along” – sometimes that was hard. Oh, my goodness, it is actually very funny to think of my parents as “bohemian hippies” because they were so conservative in so many ways! And Republican to boot! But, they were not snooty at all. They simply had great love their family and for nature, boating, etc and were true to these loves. I am eternally grateful for my wonderful parents…couldn’t have asked for better, that’s for sure. They are a big reason I can say that I am so very blessed. I am sorry that it was hard for you to have older parents. Most of my life it wasn’t hard, partly because my parents never acted or looked their age. A positive for me was having my parents all to myself as a teenager…a very special time for the three of us. The hardest time has been as an adult…not having as many adult years with them and losing my dad in my early 40s. However, since we moved here to the lake to be with them I had much more day by day time with them than any of my siblings, not that I need to compare, just saying that I was blessed to have good time with them. Good for you for having the kind of house you want to have regardless of what the neighbors do or think or say. Obviously many other people can appreciate it! I’m going to email my brother to see if he has any pics of the waterhouse on his computer or if he could scan some (I don’t have a scanner). If her does I’ll get back with you to get your email addy so I can send them along. 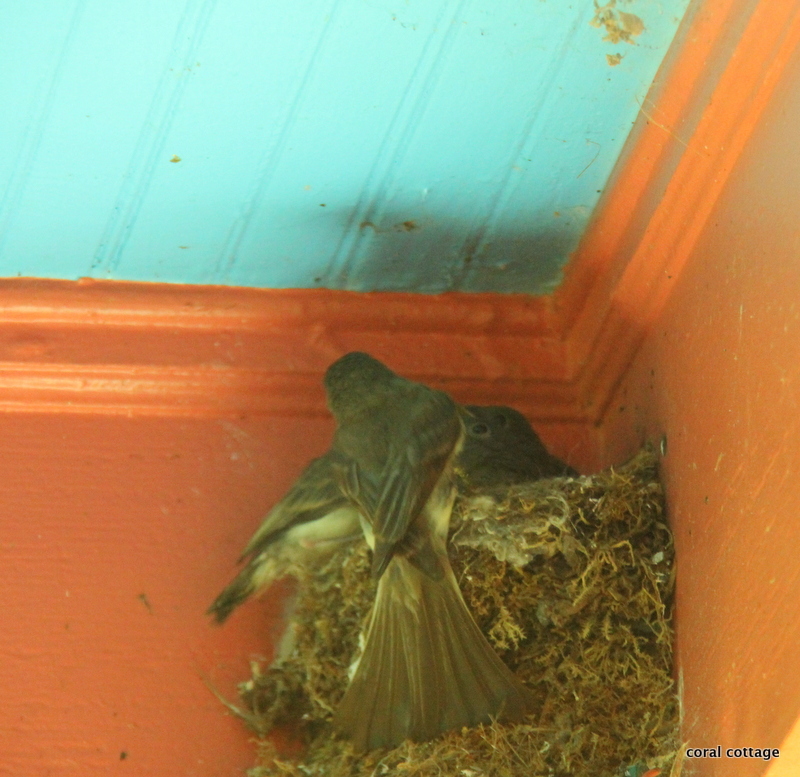 Dear Mermaid – If my wasps are any indication, it wouldn’t have done any good to tear the bird nest down. They would just come back next year and rebuild. Where do you get the metal stakes for your fused fish? Right you are about the wasp and the birds… Gosh now you make me scratch my head about those stakes. I got them from my massive stash of fine junk. I’m a horder you know and I can’t through anything out, I just might need someday. Those stakes have been around for awhile so I can’t tell you where they came from or what their original purpose was. Road trip? Girl, I live in Poverty. I was asking Poppie this evening about those teeny weeny metal stakes and he also said Lowes/H. Depot sell them but I’d have to cut them with a hack saw. Not on my agenda. So I asked if they had a cutter one could buy. Blather, blather. Didn’t get a good answer out of him. Thanks for YOUR info, Miss Mermaid. Kim, you take the loveliest bird photos, they look so sweet with their little beaks open waiting for a feed. I hope you and your family have a great 4th July day! Jen – I call my husband “peep” – because every time I walk past him he puckers up his lips for me to kiss him. I say he looks just like those baby birds waiting to be fed. That is lovely. I’m jealous! Love the wee birds, any your bouquet is beautiful. 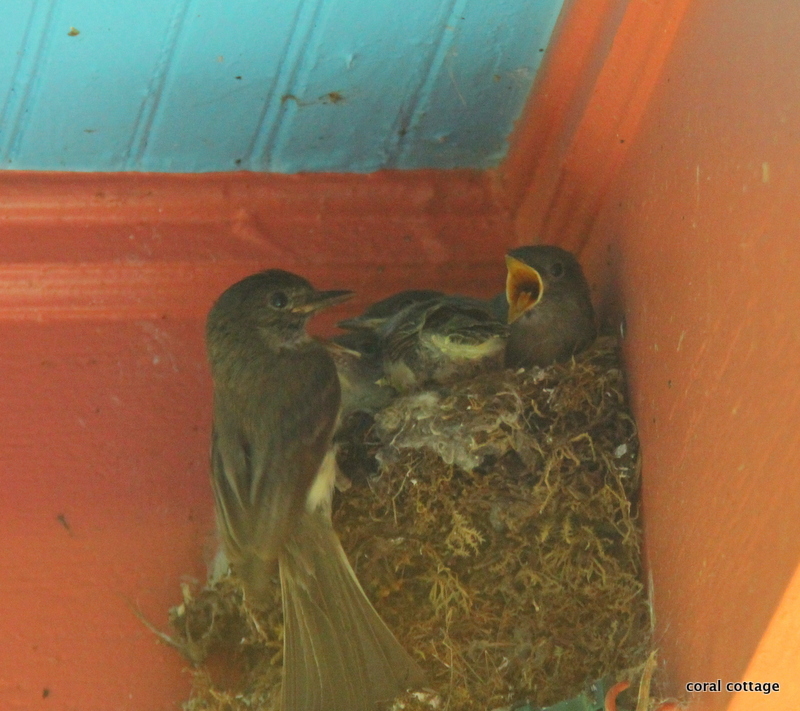 I’m thinking of three hungry girls who have flown the nest. My pleasure to share. I’m so relieved all the babies made it out safely. They didn’t go far, they are living in the big spruce tree next to the porch and sing a happy song day and night.